Amb. 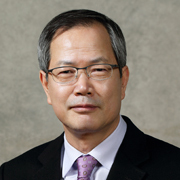 CHUN Yungwoo is a senior advisor at the Asan Institute for Policy Studies. He is also the chairman and founder of the Korean Peninsula Future Forum (KPFF). Previously, Amb. Chun served as the national security advisor to President Lee Myung-bak from 2010 to 2013. In his 33 years of service in the Ministry of Foreign Affairs, Amb. Chun served as second vice foreign minister (2009-2010), special representative for Korean Peninsula Peace and Security Affairs and head of the ROK delegation to the Six-Party Talks (2006-2008), and deputy foreign minister for Policy Planning and International Organizations (2005-2006). Amb. Chun was also the Korean ambassador to the United Kingdom (2008-2009), ambassador and deputy permanent representative to the United Nations (2003-2005), and also held earlier diplomatic postings in France, Morocco, and Austria. Amb. Chun received his B.A. from Pusan National University and Master of International Affairs from the School of International and Public Affairs at Columbia University.